“I think we lost him.” That is still one of the most chilling final lines of any movie I’ve seen. 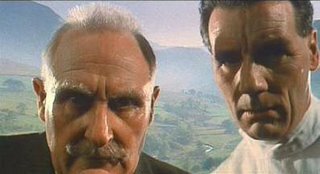 (Another very effective last line, and one of my favourite, would be: “Ernest Hemingway once said, ‘The World is a fine place and worth fighting for.’ I agree with the second part.”) And whatever else you may think about the film, Terry Gilliam’s Brazil has one of the most effective endings in film history. On the whole, I like films the way I like my sharks: single-minded. (Okay, that wasn’t exactly the most successful simile this side of Metaphysical Poetry.) Films that are trim, lean, effective. I also like the sprawling epos, but if a film is messy – if it’s jam-packed with ideas and images that in the end don’t really lead anywhere – I tend to lose patience. Brazil is a big mess of a film. 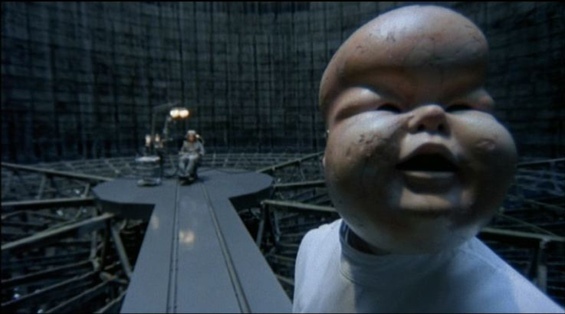 Terry Gilliam isn’t exactly a disciplined film-maker, and Brazil is one of his least disciplined movies. There are dozens of scenes, incidents and characters that seem to be in the film because it seemed a good idea at the time. It’s garish, cartoony and unfocused – very much like its central character, really. Nevertheless, for me it’s the best, most affecting dystopia on celluloid. Part of this is Gilliam’s success at using a handful of characters and actors to anchor the film in some sort of emotional reality. Yes, so many of the characters remain flat cartoons that are there for a joke or to make a point (which usually kills a film’s credibility for me), but then you’ve got Mrs. Tuttle’s anguished “What have you done with his body?” or Michael Palin’s greatest creation, Jack Lint… or Sam Lowry, Jonathan Pryce’s funniest, saddest part ever. The forlornly happy look on his face at the very end, after he’s “escaped”, still breaks my heart. And the interrogation scenes are still both funny and frightening (although I could do without the “pinball prisoner” scene). Would the film be better if it was more focused, if Gilliam had been less sprawling, running off in several different directions at once? It’s impossible to say – a streamlined, single-minded Brazil would be an entirely different movie. Sufficient to say, though, that Brazil remains my favourite Gilliam film, even after a dozen viewings. And its happy ending is the saddest ever filmed. Just make sure not to watch the “Love Conquers All” edit, unless you have an unhealthy fascination with watching road accidents as they’re happening – or if you can dissociate yourself enough from what you’re watching to observe, clinically, how a different edit can change a film into a grotesque mockery of itself. Oh, and while we’re at it: one of the most fascinating (Un-)Making Of documentaries must be Lost in La Mancha, which documents the disastrous production history of Gilliam’s take on Don Quixote. If you ever want to see a mad ex-Python as unwitting King Lear, or if you have any interest in how films come about, check it out.